The normal attitude of prayer in Sarum Use is standing. The normal position for reception of the Body and Blood of our Lord is kneeling. The normal obeisance is a deep bow. The Sarum/British crossing of oneself is right shoulder then left. Before the Service, the coverlets are removed from the Altar and the Deacon vested, carrying the Chalice, Paten, Burse, Veil, goes to the Preparation Chapel (Lady Chapel) with the Taperers and a Server. The Server presents bowl and towel, assists the Deacon wash his hands, and then, the Taperers hand him successively the specially baked, leavened bread and the cruet of red wine and water cruet, which he hands to the Deacon who pours the wine and water (cruciform) into the Chalice, and cuts and places bread on the Paten. He then places the Chalice and Paten on the Table, the purificator across it, and the Veil over all, folded up to facilitate carrying. The Entrance Procession shall form in the Vesting Chapel: Crucifer with Cross, Two Taperers, Thurifer with thurible charged and lighted, Book Bearer, with Service Book, Sub-Deacon with Gospel Book, Deacon and Priest last. The Collect for Purity and the first part of the Preparation up to the first Glory, shall be said in the halted Procession before the Quire doors of the Rood Screen. At foot of the Altar, the Deacon and Sub-Deacon abreast of the Priest, they shall say the remainder of the Preparation up to the Kiss of Peace. The Litany Procession: The holy water shall be blessed, incense brought and blessed, and the procession shall begin in the former order. At the return to the Altar, the Crucifer deposits the Cross, the Taperers deposit their candles at the step and the Thurifer takes the thurible to the right and faces inwards for the censing, the Priest goes to the Altar and kisses it and the Kyrie is sung. The Gospel Procession: The Deacon and Sub-Deacon go to the centre of the Sanctuary, bow, the senior Taperer brings the Gospel to the Priest who presents it to the Sub-Deacon. The Thurifer, Taperers and Sub-Deacon precede the Deacon in procession to the Quire Lectern. The Sub-Deacon places the Book on the Lectern and stands facing across the Lectern. The Taperers stand one on each side facing inwards, the Thurifer stands to the right ready to hand the thurible to the Deacon. The Offertory Procession: The Deacon Thurifer, Crucifer & Taperers go by the side door of the Quire into the Lady Chapel and the Deacon wearing the Humeral Veil, carrying the Chalice and Paten therewith, shall, preceded by the Crucifer, Taperers, and Thurifer, proceeds in that order from the Chapel Rood Screen door out along the south transept to the Quire door and thence to the Credence. From there, he presents the Sacrifice to the Priest. The Recession forms up in the normal order, stops at the Lectern for the Last Gospel, with taperers on either side and all others facing in to the Lectern. A station is made at the Bread Table outside the Rood Screen for the Blessing of the Eulogion Bread, a Taperer on either side of the table, the Crucifer and Thurifer facing the table, the Priest, Deacon and Sub-Deacon at the table facing it. All must be done slowly, deliberately, with dignity at all times, the purpose being to elevate and facilitate the worship of Almighty God. The English Liturgy is essentially set out in accordance with the guidelines set forth by the Commission of the Holy Synod of Russia in 1904-07 at the request of Patriarch Saint Tikhon (Belavin). Those guidelines have here been applied to the Liturgies of 1549 and 1718, themselves, both truncated versions of the Sarum original, and here including much of the Sarum Canon. Ideally, the Memorials ought to be placed after the Sursum Corda sequence, immediately before the prayer which begins “All glory be to Thee, Almighty God…” as this would reflect the correct liturgical order however this was not allowed for in the 1907 guidelines. As was the common custom regarding the 1549 Liturgy, the Sarum Vestry Chapel Vesting Office and Preparation have been added at the beginning, and likewise the Sarum Last Gospel, Eulogion Bread and Vestry Chapel Divesting Office at the end. The result meets the Holy Synod’s guidelines and its purpose in providing a culturally familiar Liturgy for converts. It should be noted that the translation used here is largely the original work of John Cosin and Thomas Brett, one of the non-Juring bishops who separated from the Church of England and held several decades of detailed discussions with the Church of Russia and other Orthodox authorities. After Mattins, the Deacon and Sub-Deacon take the elements, the Chalice, Paten, Veil and the Preparation Chapel and there prepare them using to the old Rite, setting out the Bread, mixing Wine and Water in the Chalice, leaving them on the altar there, veiled and with the Offertory Veil folded nearby. During which the Priest and ministers shall vest. The Office recited is an ancient one preserved in the Sarum Rite. the Holy Synod of Russia. All praise to Thy eternal merit, Father, Son and Holy Spirit. Ministers: For His mercy endureth forever. Priest: I confess to God Almighty, Father, Son and Holy Ghost, Blessed Mary, all the Saints, before the whole company of Heaven, and to you, that I have sinned exceedingly in thought, word and deed through my fault, my own fault, my own most grievous fault. Wherefore I pray Holy Mary, all the Saints of God and you, to pray for me. Ministers: Almighty God have mercy upon you, forgive you your sins, deliver you from every evil; confirm and strength-en you in all goodness and bring you to everlasting life. Ministers: I confess to God Almighty, Father, Son and Holy Ghost, Blessed Mary, all the Saints, before the whole company of Heaven, and to you, that I have sinned exceedingly in thought, word and deed, through my own fault, my own most grievous fault. Wherefore I pray Holy Mary, all the Saints of God and you, to pray for me. Priest: The Almighty and merciful Lord grant unto you pardon, @ absolution and remission of all your sins, time for true repentance and amendment of life and the grace and comfort of the Holy Ghost. Receive the kiss of peace and love, that ye may be fit _to perform the Divine Liturgy at the most holy Altar. Then shall the Book-bearer bring the Gospel book, during which the Choir sings the HYMN following. 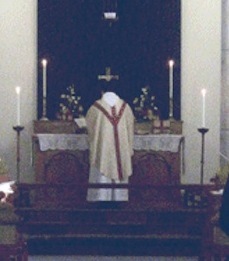 as incense is blessed and the Altar is censed. THE LITANY PROCESSION. If it is the celebration of a major feast, the Deacon brings salt and water to the Priest for blessing and all process around the church and grounds, singing the Litany. All: And in earth peace, good will towards men. We praise Thee, we bless Thee, we worship Thee, we glorify Thee, we give thanks to Thee for thy great glory, O Lord God, Heavenly King, God the Father Almighty. O Lord, the only-begotten Son Jesu Christ; O Lord God, Lamb of God, Son of the Father, that takest away the sins of the world, have mercy upon us. Thou that takest away the sins of the world, have mercy upon us, Thou that takest away the sins of the world, receive our prayer. Thou that sittest at the right hand of God the Father, have mercy upon us. For Thou only art Holy; Thou only art the Lord; Thou only, O Christ, with the Holy Ghost art most high in the glory + of God the Father. Amen. The Gloria is omitted during Advent, Lent and at Nuptials and Requiems. The Priest prays to worthily proclaim the Gospel, incense is set and the central Altar censed after the response. Priest: Cleanse my heart and my lips, O God, that I may worthily proclaim Thy Holy Gospel; through Christ our Lord. Amen. V: The Holy Gospel is written in the __ Chapter of the Gospel according to Saint __ beginning at the __ Verse. Here all shall sign themselves on forehead, lips and breast. All: The Father Almighty, maker of Heaven and earth, and of all things visible and invisible. And in one Lord bow Jesus Christ, arise the only-begotten Son of God. Begotten of His Father before all worlds. God of God, Light of Light, very God of very God. Begotten, not made, being of one essence with the Father: By Whom all things were made. And the third day He rose again, according to the Scriptures. And ascended into Heaven: And sitteth on the right hand of the Father. And He shall come again with glory to judge both the quick and the dead: Whose Kingdom shall have no end. And I believe in the Holy Ghost, the Lord, the giver of life: Who proceedeth from the Father. Who with the Father and the bow Son arise together is worshipped and glorified, Who spake by the Prophets. And I believe one, Holy, Catholic and Apostolic Church. I acknowledge one Baptism for the remission of sins. And I look for the resurrection of the dead, and the life + of the world to come. Amen. The Creed is omitted at Nuptials and Requiems. The Sermon may follow here together with notices. Then the Deacon assisted by the Thurifer and Taperers brings the Sacrifice in procession from the Preparation Chapel. In the Name of the Father + and of the Son, and of the Holy Ghost, let this Sacrifice be acceptable to Almighty God. Priest: I will wash my hands in innocency, O Lord: And so will I go to Thine Altar. Cleanse Thou me from all pollution of mind and body, that I may in purity perform the holy work of the Lord. People: The grace of the Holy Spirit enlighten thy heart and thy lips, and the Lord graciously accept this sacrifice of praise, at thy hands, for our sins and our offences, for our benefit and that of all His Holy Church. Then Priest alone says the Secret Prayer set for the day. Priest: Let us pray for the whole state of Christ’s Church. ALMIGHTY and everliving God, who by Thy Holy Apostle hast taught us to make prayers, and supplications, and to give thanks for all men; We humbly beseech Thee mercifully to accept these Holy Gifts, and to receive these our prayers and Oblations, which we offer unto Thy Divine Majesty; beseeching Thee to inspire continually the universal Church with the spirit of truth, unity, and concord. And grant that all they that do confess Thy Holy Name may agree in the truth of Thy Holy Word, and live in unity and Godly love. We beseech Thee to lead all nations in the way of righteousness and peace; and so to direct all kings and rulers, that under them Thy people may be Godly and quietly governed: And grant unto Thy servant, Elizabeth our Queen, and to all that are put in authority under her, that they may truly and impartially minister justice, to the punishment of wickedness and vice, and to the maintenance of Thy true religion, and virtue. Give grace, O Heavenly Father, to all Bishops, Priests, and Deacons, and specially to Thy servants _____ our Patriarch ________ our Metropolitan and ____ our Bishop, that they may both by their life and doctrine, set forth Thy true and living Word, and rightly and duly administer Thy Holy Sacraments. Guide and prosper, we pray Thee, all those who are labouring for the spread of Thy Gospel among the nations, and enlighten all places of education and learning; that the whole world may be filled with the knowledge of Thy Truth. And to all Thy people give Thy Heavenly grace; and especially to this congregation here present; that with meek heart and due reverence they may hear and receive Thy Holy Word; truly serving Thee in holiness and righteousness all the days of their life. And we most humbly beseech Thee of Thy goodness O Lord, to comfort and succour all them, who in this transitory life are in trouble .., sorrow .., need .., sickness .., or any other adversity. And here we give Thee most high praise and hearty thanks for Blessed Mary and all Thy saints, who have been the chosen vessels of Thy grace, and lights of the world in their several generations; and we pray that, rejoicing in their fellowship, and following their good examples, we may be partakers with them of Thy Heavenly Kingdom. Grant this, O Father, for Jesus Christ’s sake, our only Mediator and Advocate; Who liveth and reigneth with Thee and the Holy Ghost, One God, world without end. Every Priest has a duty to give Communion only to those whom he knows to be Baptised, Chrismated, Orthodox Christians. A person who has not been Baptised and Chrismated in the Orthodox Church of God may not receive the Holy Communion of the Body and Blood of our Lord and Saviour Jesus Christ. It is the custom of the Church that an Orthodox person who has not confessed his offences to a Priest, and received Absolution, should not receive the Holy Communion of the Body and Blood of our Lord and Saviour Jesus Christ until he has done so. V: Lift up your hearts. R: We lift them up unto the Lord. V: Let us give thanks unto our Lord God. R: It is meet and right so to do. R: Holy, Holy, Holy, Lord God of hosts, Heaven and earth are full of Thy glory: Glory be to Thee, O Lord most High. Priest: Blessed + is He that cometh in the Name of the Lord. R: Hosanna in the highest. All glory be to Thee Almighty God, our Heavenly Father, Who of Thy tender mercy didst give Thine only Son Jesus Christ to suffer death upon the Cross for our redemption; Who made there, by His own oblation of Himself once offered, a full, perfect and sufficient sacrifice, oblation, and satisfaction, for the sins of the whole world; and did institute, and in His Holy Gospel command us to continue, a perpetual memory of that His precious death and Sacrifice, until His coming again. Who in the same night that He was betrayed, took Bread And, when He had given thanks, He brake it, and gave it to His Disciples, saying, Take, eat; This is My Body which is given for you; do this in remembrance of Me. Likewise after supper, He took the Cup; And when He had given thanks, He gave it to them, saying, Drink ye all of this; for this is My Blood of the New Covenant, which is shed for you and for many for the remission of sins; do this as oft as ye shall drink it, in remembrance of Me. that Thou hast commanded for our salvation, that Thou mayest be pleased to send down Thy Holy Spirit upon this Sacrifice that It may be duly and properly changed in the Name of the Father and of the Son and of the Holy Ghost, in the transformation of the Body + and Blood + of our Lord, Jesus Christ and that It may be for us who partake thereof, Life eternal and the everlasting Kingdom. And we entirely desire Thy Fatherly goodness mercifully to accept this our Sacrifice, our praise and thanksgiving, upon which vouchsafe to look and to accept as Thou didst accept the gifts of Thy servant Abel, the sacrifices of our father Abraham and Thy high priest Melchisedeck, most humbly beseeching Thee to grant that, by the merits and death of Thy Son Jesus Christ, and through faith in His Blood, we and all Thy whole Church may obtain remission of our sins, and all other benefits of His Passion. And here we offer and present unto Thee, O Lord, ourselves, our souls and bodies, to be a reasonable, holy, and lively sacrifice unto Thee; Humbly beseeching Thee, that all we, who are partakers of this Holy Communion, may worthily receive the most precious Body + and Blood + of Thy Son Jesus Christ, be fulfilled with Thy grace and Heavenly benediction and made one body with Him, that He may dwell in us and we in Him. Be mindful, O Lord, we pray Thee, of Thy servants departed this life in Thy faith and fear, now resting in peace, here the names of the departed may be included To them and to all Thy faithful sleeping in Christ, grant, we beseech Thee, Thy rest, Thy light and Thy peace. And to us sinners who are Thy servants, grant confidence in the multitude of all Thy mercies and some lot and part with Thy Holy Apostles and Martyrs John, Stephen, Matthias, Barnabas, Ignatius, Alexander, Marcellinus, Peter, Felicity, Perpetua, Agatha, Lucy, Agnes, Cecelia, Anastasia and all Thy Saints, into whose company, we pray Thee of Thy mercy, to admit us. By Whom + and with Whom + in the unity of the Holy Ghost, all honour and glory be unto Thee, O Father Almighty + more loudly; World without end. The Deacon covers the Chalice and Paten. All: Which art in Heaven, Hallowed be Thy Name; Thy Kingdom come; Thy will be done; In earth as it is in Heaven. Give us this day our daily bread. And forgive us our trespasses, As we forgive them that trespass against us. And lead us not into temptation; But deliver us from evil: For Thine is the Kingdom, the power, and the glory, for ever and ever. Amen. Priest: Deliver us O Lord, we beseech Thee, from all evils past, present and to come; and at the intercession of the Blessed and glorious Virgin Mary, Mother of God, and of Thy blessed Apostles Peter, Here the Deacon gives the small Paten to the Priest who shall kiss it, place it before his left and right eyes, cross himself with it, return it and the Deacon shall then slide it under the corporas. Paul, Andrew and all the Saints + graciously granting us peace now, that with the help of Thy loving kindness we may ever be free from sin and disquietude. Priest: Christ our Paschal Lamb is offered up for us, since for all, He bore our sins on His Body upon the Cross. For He is the very Lamb of God, that taketh away the sins of the world. Wherefore let us keep a joyful and holy feast with the Lord. Let this most Holy + union of the Body and Blood of our Lord, Jesus Christ, be to me and to all who receive It, health of mind and body and a saving preparation for worthily attaining unto everlasting life. Through Jesus Christ our Lord. Amen. O Lord, Holy Father, Almighty, everlasting God, grant me to so worthily receive this most Holy Body and Blood of Thy Son our Lord Jesus Christ that I may thereby receive forgiveness of all my sins, be filled with Thy Holy Spirit and have Thy peace; for Thou only art God, there is none other beside Thee, Whose Kingdom and glorious dominium abideth ever world without end. Amen. We do not presume to come to this Thy Table, O Merciful Lord, trusting in our own righteousness, but in Thy manifold and great mercies. We are not worthy so much as to gather up the crumbs under Thy Table. But Thou art the same Lord whose property is always to have mercy; grant us therefore, gracious Lord, so to eat the Flesh of Thy dear Son Jesus Christ, and to drink His Blood in these Holy Mysteries, that our sinful bodies may be made clean by His Body, and our souls washed through His Most Precious Blood, and that we may evermore dwell in Him, and He in us. Amen. Lord, I am not worthy, that thou shouldst come under my roof: But speak the word only, and my soul shall be healed. The Priest turns to the people with the Host above the Chalice held high, making the sign of the Cross with them. The people cross themselves. Priest: Behold the + Lamb of God, behold Him that taketh away the sins of the world. The Body of our Lord Jesus Christ, which is given for thee. Preserve thy body and soul unto everlasting life. The Blood of our Lord, Jesus Christ, which is shed for thee. Preserve thy body and soul unto everlasting life. Priest: Let us pray. Having now received the precious Body and Blood of Christ, let us give thanks unto our Lord God. ALMIGHTY and everliving God, we most heartily thank Thee, for that Thou dost vouchsafe to feed us, who have duly received these Holy Mysteries, with the spiritual food of the Most Precious Body and Blood of Thy Son, our Saviour Jesus Christ. And dost assure us thereby of Thy favour and goodness towards us: And that we are very members incorporate in the Mystical Body of Thy Son, Which is the blessed company of all faithful people. And are also heirs through hope of Thy everlasting Kingdom, by the merits of the Most Precious Death and Passion of Thy dear Son. And we most humbly beseech Thee, O Heavenly Father, so to assist us with Thy grace, that we may continue in that holy fellowship, and do all such good works as Thou hast prepared for us to walk in. Through Jesus Christ our Lord, to Whom, with Thee and the Holy Ghost, be all honour and glory, world without end. Deacon: Let us depart in peace. Priest: The peace of God, which passeth all understanding, keep your hearts and minds in the knowledge and love of God, and of His Son Jesus Christ our Lord: And the blessing of God Almighty, + Father, Son, and Holy Ghost, be amongst you and remain with you always. To be read by the Priest in the course of the recession. There was a man sent from God, whose name was John. The same came for a witness, to bear witness of the Light, that all men through Him might believe. He was not that Light, but was sent to bear witness of that Light. That was the true Light, which lighteth every man that cometh into the world. He was in the world, and the world was made by Him, and the world knew Him not. He came unto His own, and His own received him not. But as many as received Him, to them gave He power to become the sons of God, even to them that believe on His name, which were born, not of blood, nor of the will of the flesh, nor of the will of man, but of God. bow And the Word was made flesh, and dwelt among us, arise (and we beheld his glory, the glory as of the Only-Begotten of the Father) full of grace and truth. The Priest and ministers process from the Sanctuary to the Eulogion table. Priest: Let us pray, Bless, + O Lord, this creature of bread, as Thou didst bless the five loaves in the wilderness; That all who taste thereof may receive health both in body and soul. In the Name + of the Father, and + of the Son, and of the Holy + Ghost. Amen. Then shall he sprinkle the bread with the holy water and two Taperers shall carry the bread to a convenient place in the nave and the bread shall be distributed to all by the Priest and ministers . Priest: O Lord, we pray Thee, forgive the imperfections of our Service, our wandering inattention to Thy word and our failure to pay our attention to Thee alone. We pray Thee, Bless them for whom we have asked Thy blessing, Heal them for whom we have asked Thy healing, Feed them for whom we have asked Thy feeding, Assist them for whom we have asked Thine assistance, Comfort them for whom we have asked Thy comforting. Let no imperfection of our Service affect them for whom we have prayed or the benefits that we receive from this Holy Mystery. We pray this through Jesus Christ our Lord, who liveth and reigneth with Thee, and the Holy Ghost, One God, world without end. Then shall they proceed to the Vestry Chapel for the Divesting Office. O ye Priests of the Lord, bless ye the Lord : Praise Him and magnify Him forever. O ye servants of the Lord, bless ye the Lord : Praise Him and magnify Him forever. O ye Spirits and souls of the Righteous, bless ye the Lord : Praise Him and magnify Him forever. O ye holy and humble men of heart, bless ye the Lord : Praise Him and magnify Him forever. O Ananias, Azarias and Misael, bless ye the Lord : Praise Him and magnify Him forever. O praise God in His Holiness : Praise Him in the firmament of His power. Praise Him in His noble acts : Praise Him according to His excellent greatness. Praise Him in the sound of the trumpet : Praise Him upon the lute and the harp. Praise Him in the cymbals and dances : Praise Him upon the loud cymbals. Let everything that hath breath : Praise the Lord. V: Blessed art Thou O Lord, in the firmament of Heaven, to be _praised and glorified above all forever. Prevent us, O Lord, with Thy most gracious favour and further us with Thy continual help, that in all our doings begun, continued and ended in Thee, we may do always that is righteous in Thy sight. Through Jesus Christ our Lord. Amen.